The PE fundraising trail hasn't been too difficult to navigate lately. For one, most newly raised funds are larger in size than their predecessors. In fact, about 69% of the funds that closed in Europe and North America last year were larger than their predecessors, and the percentage was even higher for 2016 vintages—nearly 76%, per our recent PE & VC Fundraising Mid-Year Update. 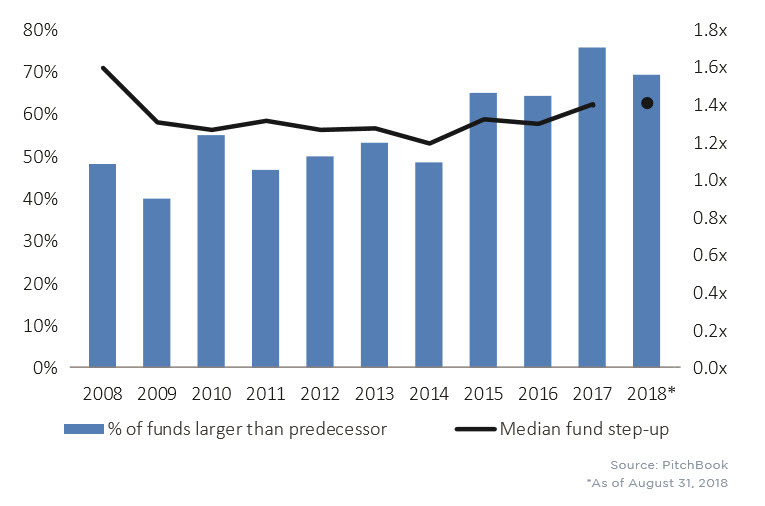 Moreover, median PE fund step-ups have been visibly bigger in recent years, with both 2017 and 2018 vintages coming in at 1.4x larger versus their predecessors. The time taken to raise those funds is also going down, as LPs quickly allocate capital to the ever-growing asset class. On average, 2018 vintage funds have wrapped up in 12.4 months, down from a more typical 16-month timeframe seen from 2012 to 2016. That decline in time to close likely reflects less difficulty in PE firms hitting their hard targets toward the end of their fundraises. That said, there is some evidence that the fundraising bonanza is slowing. Viewing the figures through a four-quarter rolling average smooths out the data somewhat, helping control for outlier $10 billion-plus funds that can skew the bigger picture. The rolling average for both fund counts and capital raised in Europe and North America is swinging down, a trend that began around the middle of 2017. We're not ready to say fundraising has peaked—it's cyclical, and this is one of the better ways to visualize that—but it does provide credence to recent side conversations about fundraising. Fewer funds are outperforming their equivalents in the public markets, and distributions to LPs from prior funds are slowing down. Depending what happens with the current run in the bull market, LPs may rethink their alternatives allocations in the near future, if they haven't already. Read more about PE fundraising in our PE & VC Fundraising Mid-Year Update.